The Stratagus League aims to promote and encourage the use Stratagus in the multiplayer realm. Stratagus is a free cross-platform real-time strategy gaming engine. Games that run it include Aleona's Tales, Doom Wars, and Wargus. Games that run on engines related to Stratagus such as BOS Wars and Freecraft are also promoted. 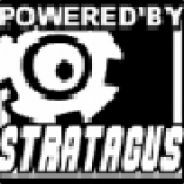 Joining the Stratagus League Steam Group means that you'll be informed of when multiplayer matches are taking place. In addition, you can also join Stratagus League as a clan in Shogun 2, and play in the occasional Men of War match. Behold, the new version of Doom Wars: UAC vs. Hell has been finally released! This one took a lot of time and work, but now, it's complete. Hey guys, have any of you ever managed to play a full wargus game without it getting out of sync? No matter what version we play, on internet or LAN, it eventually dies. Always played in windows though; maybe in the linux versions it's different? I'm up for a Wargus Trunk match.